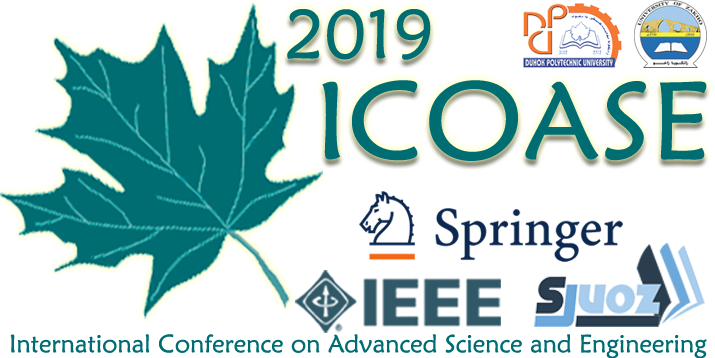 The ICOASE2019 is jointly organized by the University of Zakho and Duhok Polytechnic University with the scientific sponsorship of IEEE. The University of Zakho (UoZ) dates back to the year 2005, however, a formal order was issued on 8th of July 2010 by the Presidency of the Council of Ministers in KRG (sixth cabinet). The structures of the University of Zakho for the academic year 2016-2017. The University of Zakho consists of three Faculties (Science, Humanities, and Education) and three Colleges (Engineering, Administration and Economic, and basic Education). The educational programs at the University of Zakho include bachelor’s and master’s degree and doctoral programs. These programs give the graduates a wide range of knowledge and skills. Read more about UoZ. The Duhok Polytechnic University (informally DPU) is a collegiate research university located in Kurdistan Region-Iraq. Kurdistan Region is rapidly evolving and has witnessed a continual shift in educational needs for its society. Both higher education enrollments and the number of institutions have expanded dramatically during the last decade. As a public multi-campus university, DPU has eight technical institutes and four technical colleges in seven districts within Duhok Governorate, each of which has a unique community with local economic, social, cultural, and environmental development needs. Duhok Polytechnic University, established in 2012, is one of three polytechnic universities in Kurdistan under the auspices of the (KRG) Ministry of Higher Education and Scientific Research. DPU was originally descended from the oldest institute in Duhok Governorate in 1988, with 19558 graduates since then. Students enrolled in DPU are selected based on their scores at high school. Classes begin in late September and last until the end of June. Read more about DPU. The Institute of Electrical and Electronics Engineers (IEEE, pronounced “I triple E”) is a professional association with its corporate office in New York City and its operations center in Piscataway, New Jersey. It was formed in 1963 from the amalgamation of the American Institute of Electrical Engineers and the Institute of Radio Engineers. Today, it is the world’s largest association of technical professionals with more than 400,000 members in chapters around the world. Its objectives are the educational and technical advancement of electrical and electronic engineering, telecommunications, computer engineering and allied disciplines. Read more about IEEE.